In order for a swimming pool to last many years and not require constant repair, it is essential to make sure that its structure is waterproofed in a timely manner. Waterproofing plays a crucial role in sealing the construction and assuring its long life. This is because water places serious loads on the swimming pool structure and is an aggressive factor both for its frame and for all materials used in its construction. The OOO Aquatron-BKhK сompany offers innovative penetrating materials that reliably protect the reservoir against leakage. Our waterproofing mixtures contain Portland cement, sand, and special modified additives that significantly improve the properties of the concrete foundation. A large number of technologies exist for insulating artificial bodies of water. They differ from each other basically in the particulars of how the various materials are applied. Treating with Aquatron penetrating compounds is one of the most progressive methods for water insulation of a swimming pool. They consist of special substances that penetrate deeply into the pores of concrete with the subsequent formation of insoluble crystals, which block the passage of liquid. 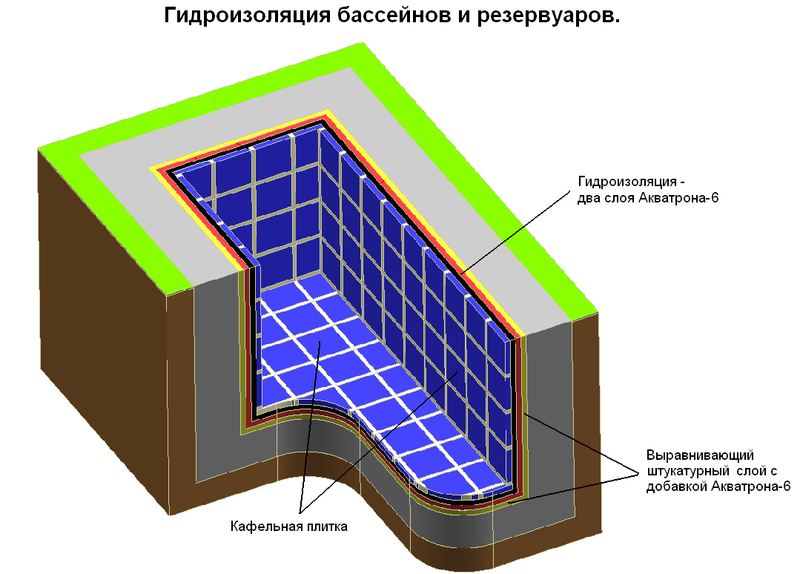 Thus, when used, the waterproofing mixtures have a relay character: as soon as a new contact with water molecules occurs, the chemical reaction is renewed and the process of making the structure of the material more dense proceeds into the interior of the structure. The main advantage of this method of waterproofing swimming pools is the ability to impregnate the surface to be waterproofed from within. In addition, the penetrating compounds provide stronger concrete and increase its resistance to freezing and to the appearance of microorganisms and mold. 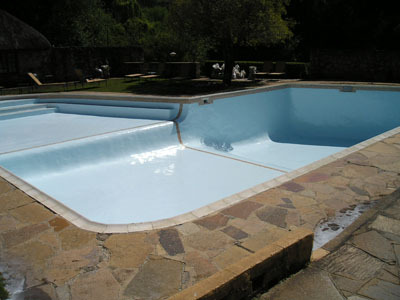 Finishing work may be done 7 to 8 days after waterproofing the pool. Finishing work can be done 7 to 8 days after waterproofing.